The rise of the Mayan culture took place between 200 and 800 AD. Architectural innovations of the period include pyramids, temples and ceremonial centers. Creators of the only known fully developed written language of the pre-Columbian Americas who made incredible advances in mathematics, astrology, and art, the Mayan legacy is alive with tradition, history and scientific progress. Modern science is still trying to recover the much of the Maya’s heritage, which has been lost and in some cases purposely destroyed over time. However, some of their treasures have already been uncovered. Here are 5 of the archaeological sites on the Yucatan Peninsula where you can see the indisputable greatness of the Maya for yourself. This Mayan site was once an important coastal port and is the only walled city discovered on the Yucatan Peninsula to date. El Castillo, the main building, is built on a 12 meter cliff overlooking the amazing turquoise Caribbean Sea. The spectacular history and views offered by Tulum are beyond compare. 45 minutes south of Playa del Carmen, it is considered one of the most famous and important archaeological sites in the region. Recently named one of the New Seven Wonders of the World, Chichén Itzá’s archaeological significance is a testament to the Maya and their scientific advancements. Chichén Itzá means “mouth of the well of the Itza” (Itza is an ethnic-lineage group that gained political and economic dominance of the northern peninsula) and is the most powerful ancient city in the area. The city of Chichén Itzá is an architectural complex of the Postclassical period (1200-1521). The Castle or Temple of Kukulkan, is a spectacular nine story structure where the decent of the Feathered Serpent God can be witnessed during an equinox. The sacred cenote, a stunning water well located on the archaeological zone is more than 50 meters in diameter with steep cliffs that reach 20 meters down to the water’s surface. This site offers the most extensive view of the Mayan culture and is situated around two lagoons. One pyramid in the area of the Nochoch Mul (large mound) structures is some 42 meters high. Cobá is located about 90 kilometers east of Chichén Itzá and is thought to at one time have had some 50,000 inhabitants. The Mayan community continues to thrive in the area around Cobá. They share customs and traditions through tourism. They run craft and ceramic workshops which are open to the public, an important cultural attraction in the Yucatan Peninsula. This archaeological site is considered one of the most beautiful in all of Mexico. The temples date back to circa 500 B.C. and are in almost perfect condition. Uxmal is surrounded by legend, myths and anecdotes. 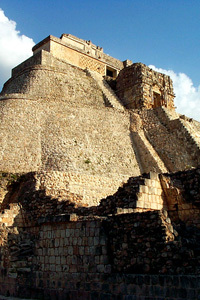 Uxmal is located in the Puuc or hilly region of the state of Yucatan. The Pyramid of the Magician’s is breathtaking and was built to take advantage of the terrain to gain height. The Governor’s Palace covers more than 1200 square meters. One of the most striking features of the architecture at Uxmal is the construction of a well system that once served to collect and conserve drinking water, which helped to transform the village community into a political and administrative center. This huge 40 square kilometer settlement dates back to 200 B.C. and is an excellent example of the Mayan architectural development and construction. This is the largest and most important settlement in the central Maya lowlands or Río Bec region of Quintana Roo. It is covered by giant ceiba trees, which is the sacred tree of the Maya. Here you will still find mounds of only partially excavated structures. Kinichná (House of the Sun) was part of Dzibanché even though it is several miles away and boasts a pyramid so massive that it can’t be captured by a camera from close range. If you would like to visit us and these archaeological sites, our concierge can help plan and book the perfect tours for you.